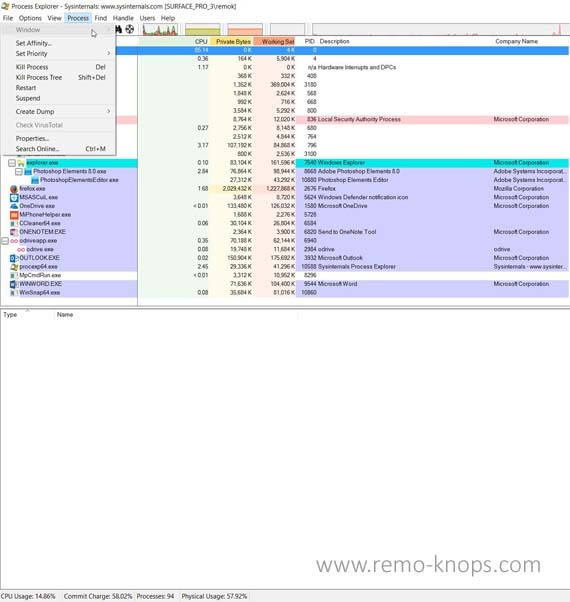 John Obeto, CEO and Chief Technology Officer of Logikworx, shared the PCWorld article: “How to use Process Explorer, Microsoft’s free, supercharged Task Manager alternative“. Process Explorer is an application from the famous Windows Sysinternals suite, original developed by Bryce Cogswell and Mark Russinovich from Winternals Software LP. We all have experienced the situation where a particular application or process is consuming more RAM memory or CPU than expected. Personally I open up the Windows Task Manager to see which application or process is taking the resources from my laptop. 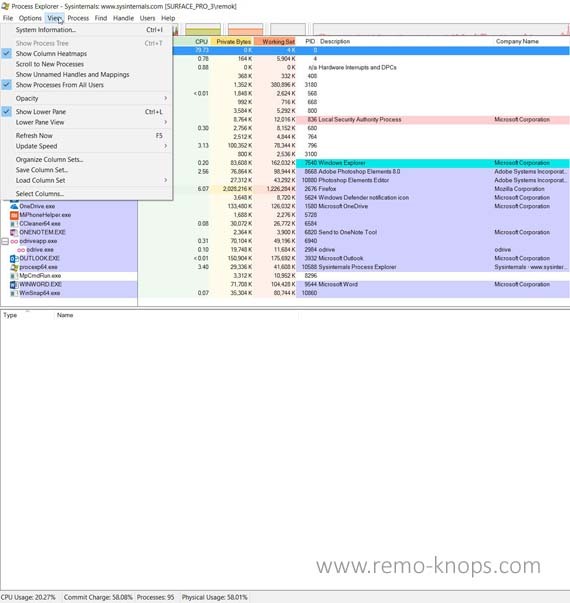 While the default Windows Task Manager is ok for the majority of user, Systinternals Process Explorer is a supercharged version free for download from Microsoft TechNet. I have been using Process Explorer v16.2, which was published on February 17, 2017. In this section I’ll provide a brief overview of the Process Explorer menu structure, with help of some screenshots. In the file menu you can easily run or run a process as an administrator, while you also can shutdown your laptop from this Process Explorer menu section. In the options menu section you can replace the default Windows Task Manager with Sysinternals Process Explorer with a simple click. Furthermore you can set Process Explorer to run at Windows logon. Personally I’ve also checked the option to hide Process Explorer when minimized (so you can open the window from you notification area). The view menu section is aimed at how you want to organize the window. In the Process menu section you can kill a process or process tree or look-up the properties of a certain process. Personally I haven’t changed the priority or created a dump, but those are options available as well. The search online option is helpful if you want to gain more understanding and context of a certain Windows- or application process. The find menu section triggers the Process Explorer search function, so you can search for a process handle or DLL. In the handle section you can close a handle or look up the properties of a certain handle. Finally in the Help menu section you can open the Sysinternals Process Explorer help-file and check out the version number as shown in one of the pictures above. Sysinternals Process Explorer is a free Microsoft tool that grows on you while using it, especially if you are interested in the functioning of Windows technology. Process Explorer provides more in-depth information about the running processes, and has advanced capabilities for the tech savvy Windows users. On Channel9 you can find the Tech Ed North America 2010 video “Windows Sysinternals Primer: Process Explorer, Process Monitor, and More” with Tim Reckmeyer and Aaron Margosis. 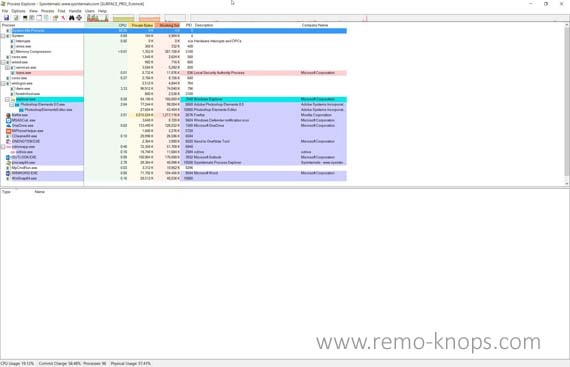 In the 1:15 hour video you will get an extensive overview of Sysinternals Process Explorer and Process Monitor with a bunch of demo’s. 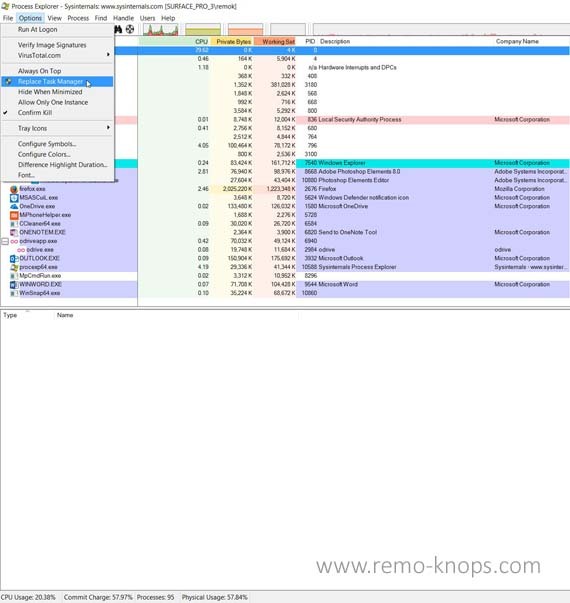 Hey!, I found this information for you: "Process Explorer – Sysinternals enhanced task manager". 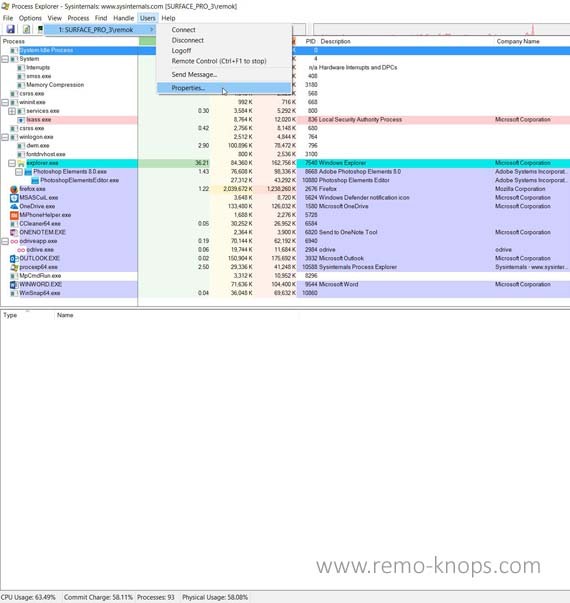 Here is the website link: https://www.remo-knops.com/6151/process-explorer-sysinternals-task-manager/. Thank you.